IntelliTech offers a Try & Buy program for our North American customers in Canada, Mexico and the United states. For customers in other global regions, please Contact IntelliTech Sales to inquire about arrangements for a printer evaluation. The IntelliBar Label Printers Try & Buy Program allows you to test a new IntelliBar label printer at your location, with your equipment, computers and the right media for your application. If the IntelliBar printer works as advertised you buy it, if not you return it to us with no strings attached. We understand that selecting the perfect label printer can be a daunting task. We want you to be sure that an IntelliBar label printer will easily integrate into your system and that our Labels meet your needs. Our Try & Buy Program allows you to use an IntelliBar Label Printer at your site for a few business days while you test its capabilities on your own applications. During your trial period, we will be happy to help answer any questions you have, walk you through driver installations and offer suggestions for optimal use in your environment. Several of the Software packages from our partners offer trial versions that you could investigate during this period, as well. 1. Complete the form on this page. 2. When IntelliTech receives your inquiry, we will contact you to determine which IntelliBar printer best serves your needs. We will then send you a Try and Buy Agreement for you to sign and return to us. 3. IntelliTech ships the printer to you. 4. Upon receipt of the printer, you have 7 business days to evaluate the printer. 5. At the end of the 7-business day evaluation period, we will charge your credit card, unless you notify us that you want to return the printer. 6. If you would like to return the printer, please Contact Sales for your RMA number before the evaluation period expires. If the printer is returned as agreed and without damage, you will not be charged. Please follow all packing instructions to avoid damage to the printer during shipping. To request more information, complete and submit the Learn More About the IntelliBar Try & Buy Program form on this page and include the comment "Request more information" in the Questions and Comments field. 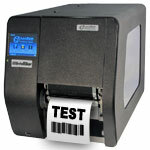 Test an IntelliBar label printer in your own environment.